The noted botanical artist Regina Hughes explained in a 1987 interview that her drawings required enormous patience beccause “you must be exact to the last millimeter”. Hughes is usually associated with her agave drawings (Howard Scott Gentry’s Agaves of Continental North America ) or her orchid and bromeliad paintings, but over the course of her career, she also became an expert in drawing seeds. Most of of her seed drawings can be found in the 1977 USDA publication, Economically Important Foreign Weeds , a hefty manual that was used at the time by the U.S. Customs Department. 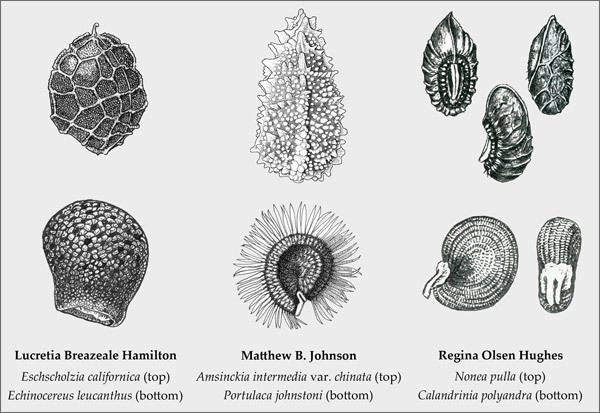 Nearly all of her 6,000 drawings for the book were of seeds (she also wrote the descriptions of the book’s 1,200 species). Despite the countless hours spent looking at seeds through her microscope, she said that she found them endlessly fascinating. The University of Arizona Herbarium’s collection of botanical illustrations includes hundreds of such painstakingly prepared drawings by Hughes and Lucretia Hamilton. Adding to their legacy of intricately detailed drawings are works by Matt Johnson, several of which were included in the Florilegium’s recent exhibit. This appeared in the November 2013 issue of The Desert Breeze, the monthly newsletter of the Tucson Cactus and Succulent Society.